Yesterday’s analysis expected upwards movement which is exactly what happened. This wave count agrees with MACD and has some nice Fibonacci ratios in price and Fibonacci relationships in time. Minor wave 3 is 15.1 points longer than 2.618 the length of minor wave 1. Ratios within minor wave 3 are: there is no Fibonacci ratio between minute waves iii and i, and minute wave v is 5.44 points longer than equality with minute wave iii. Minor wave 5 may not exhibit a Fibonacci time relationship. The next possibility may be the 29th of October (give or take two days either side of this date) where minor wave 5 would have lasted a Fibonacci 89 days. Upwards movement has coincided with an increase in upwards momentum as expected. The middle of this third wave is almost over. At 1,690 micro wave 5 within subminuette wave iii would reach equality with micro wave 1. Because there is no Fibonacci ratio between micro waves 1 and 3 we should expect a Fibonacci ratio for micro wave 5 and either of 1 or 3, and equality with 1 is the most common relationship so this target has a good probability. At 1,694 subminuette wave iii would reach 1.618 the length of subminuette wave i.
I favour the lower end of this 4 point target zone because it is calculated at a lower wave degree. 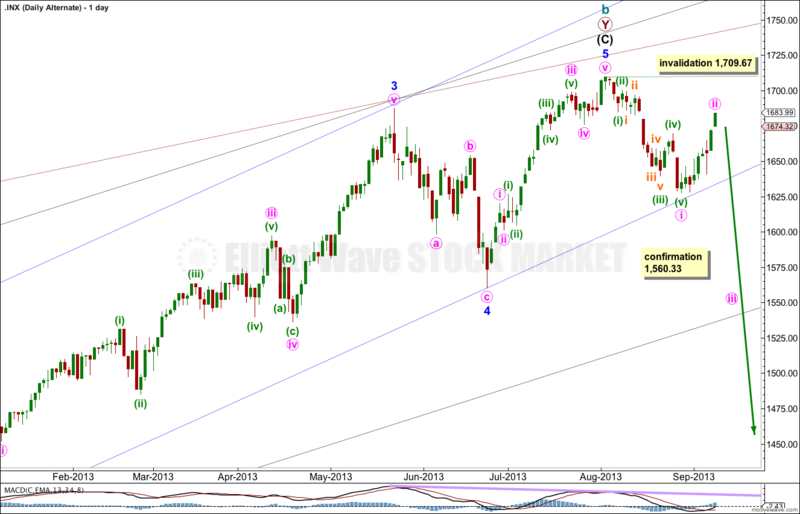 Subminuette wave ii was a relatively shallow 43% zigzag correction. 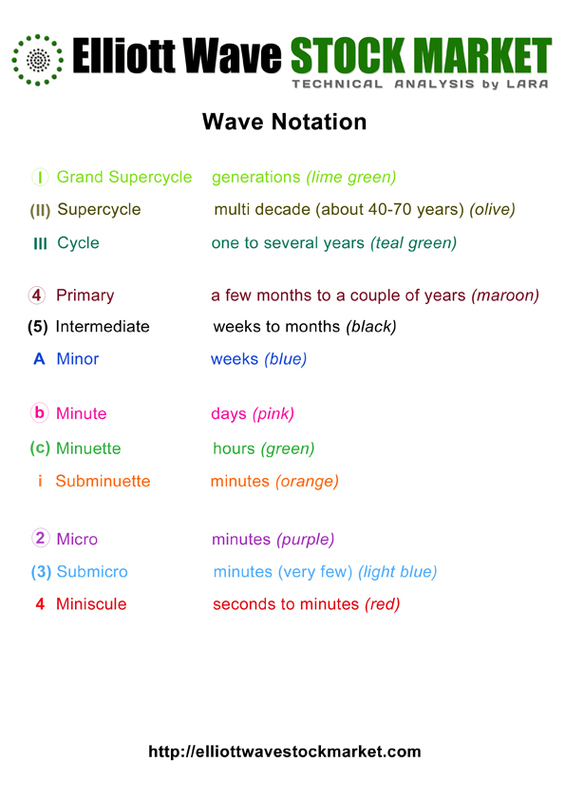 Subminuette wave iv may be a relatively deeper flat, combination or triangle. It should be over within a few hours, or may last an entire session but this is less likely. Subminuette wave iv may not move into subminuette wave i price territory. 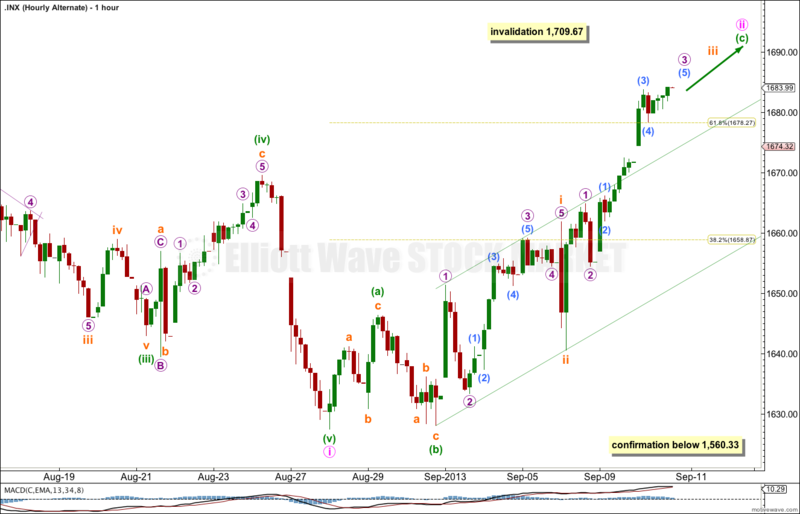 This wave count is invalidated with movement below 1,664.83. At 1,695 minuette wave (iii) would reach 1.618 the length of minuette wave (i). At 1,720 minute wave iii would reach 0.618 the length of minute wave i. While price remains below 1,709.67 it will remain possible that we have recently seen a trend change at cycle degree. However, we should always assume the trend remains the same until proven otherwise. This is a huge trend change. The new downwards trend should last from one to several years and take price substantially below 666.76. We need some confirmation before having confidence in this wave count. We should assume the trend is upwards until this wave count is confirmed with movement below 1,560.33, and then with a breach of the black parallel channel on the daily chart. This wave count is the same as the main wave count, except the degree of labeling in the final upwards wave of minor wave 5 is moved up one degree. I have adjusted the wave count within minute wave ii to fit with subdivisions on the main wave count. This has a much better fit. Minute wave ii may be an incomplete flat correction. However, technically this is a regular flat because minuette wave (b) is less than 105% the length of minuette wave (a). Regular flats normally have C waves which are close to equality with A waves, and normally sit nicely in parallel channels. They move sideways. This correction, if that is what it is, is clearly not behaving like a regular flat correction. Minuette wave (c) would be incomplete. 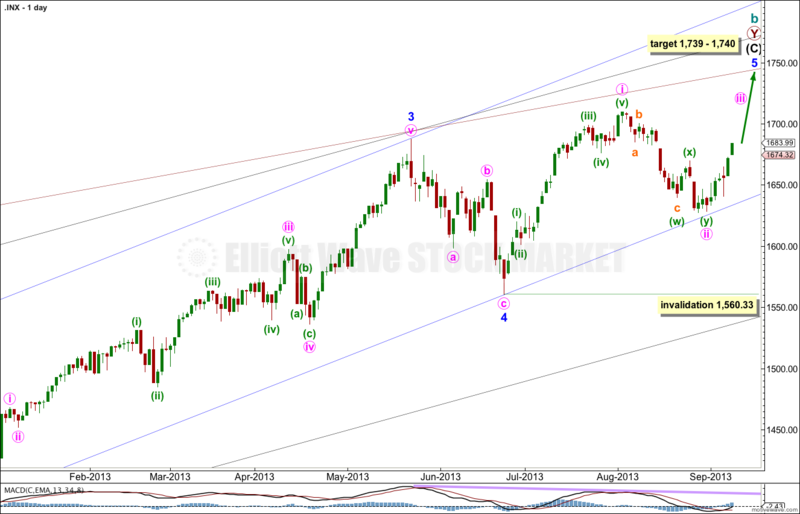 If this wave count is correct it may come to a speedy conclusion. The next movement for this alternate would be a strong third wave downwards. Minute wave ii may not move beyond the start of minute wave i. 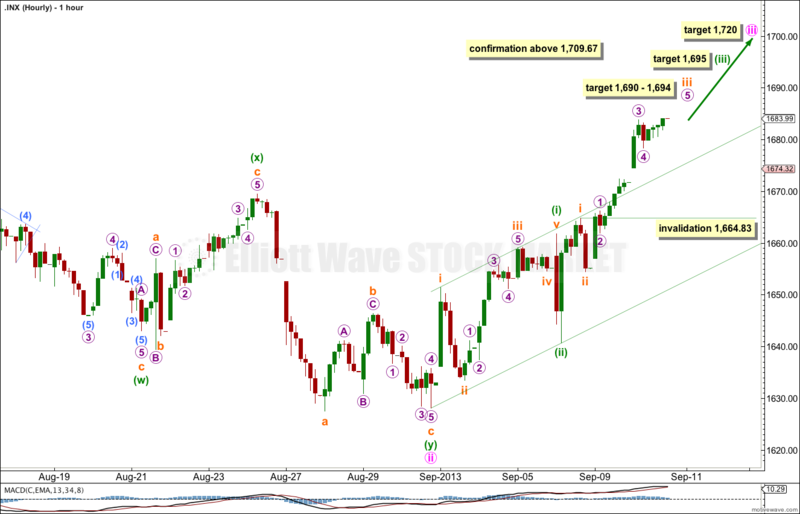 This wave count is invalidated with movement above 1,709.67. I’m the guy who criticized your minute ii a few weeks back. The one question I have is the look of your double ZZ. To my naked eye, the look of it doesn’t fit. The best fit for my eye is a five wave impulse down. Does the double ZZ really have the right look to you? It looks like its missing the last c wave. Is it normal for it to truncate? I agree, the double zigzag does not have the right look. Truncations normally occur only after the prior wave travelled “too far too fast” which is not exactly the case here. However… I have seen truncations like this before, albeit rarely. The biggest determinator of whether a wave count is correct or not in my experience is the subdivisions; do they fit correctly? Then, the next consideration, does it have the “right look”? Overall, as I’ve stated in the video, that downwards wave does fit best as a five wave impulse. But now the following upwards movement also fits best as an unfolding five wave impulse. 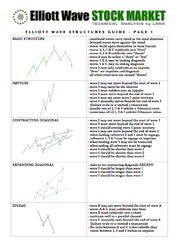 While price remains between the invalidation points both wave counts will remain valid. Blackjak – thanks for the “criticism”. It’s made me go back and take another hard look at that movement to try and see a better interpretation. And you’re right, that double zigzag didn’t look right. I have a much better fit. It took me a while to see past some blocks I had, but finally, I have a much better wave count for you today.